10:14 PM EDT 20 October – It is clear now that just exactly how Quaddafi died and who killed him will long be in dispute. If you go to CNN, you will find that he died in a crossfire. But across the pond, the UK’s Daily Mail has a different account, replete with graphic pictures. He died from a shot to the head from an assassin. At approximately 4:14 PM EDT today, CNN on air reported that a US fired hellfire missle from drone and French Mirage jet attacked a convoy carrying Gaddafi. He was not killed at that time but exited his vehicle and went with his men. He was later captured by the insurgents but it is still not clear about his final moments. The point here is, the US facilitated his capture, not his death. Colonel Ahmed Bani, the military spokesman of the National Transition Council, has confirmed to Al Jazeera that Muammar Gaddafi has been killed. Abdul Hakim Belhaj, an NTC military chief, said Gaddafi had died of his wounds after being captured near his hometown Sirte. The body of the former Libyan leader was taken to a location which is being kept secret for security reasons, an NTC official said. “Gaddafi’s body is with our unit in a car and we are taking the body to a secret place for security reasons,” Mohamed Abdel Kafi, an NTC official in the city of Misrata, told Reuters. Earlier, Abdel Majid, another NTC official, said the toppled leader had been wounded in both legs. A photograph taken on a mobile phone appeared to show Gaddafi heavily bloodied, but it was not possible to confirm the authenticity of the picture. The news came shortly after the NTC captured Sirte, Gaddafi’s hometown, after weeks of fighting. “Thank God they have caught this person. In one hour, Sirte was liberated,” a fighter in the town said. Another NTC commander said that Moussa Ibrahim, former spokesman for Gaddafi’s fallen government, was captured near Sirte. Abdul Hakim Al Jalil, commander of the 11th brigade, also said he had seen the body of the chief of Gaddafi’s armed forces, Abu Bakr Younus Jabr. “I’ve seen him with my own eyes,” he said and showed Reuters a picture of Jabr’s body. NATO and the US state department said they could not confirm any reports. Meanwhile in Benghazi, crowds gathered in the streets to start celebrating the reports of Gaddafi’s death. ← Smoke-Filled Athens Sees One of the Largest Protests Yet. I have to say that no matter the person or his/her crime, it is a terrible thing to meet a painful and untimely end. Even though they bring it on themselves, no one deserves to endure such physical pain. I look at Gaddafi and suddenly he is just a mortal man in the throws of his passage out – weakened and bloodied and it is crushing as one human to look upon the suffering of another. He was just a mortal man capable of the most despicable crimes against his own people. Afternoon, AFVET. I wish all despots would remember what you have said. Breaking news as per Rush. John McCain is giving Obama credit for killing Khadafi. Arizona, your gift just keeps on giving. Hey America,…..the congress is not a freaking rest home !!!!!!!!! lolololol – ROFL. Ay AFVET! Very fine observation. He is now a caricature of himself. Someone needs to strap him to his Senate chair. 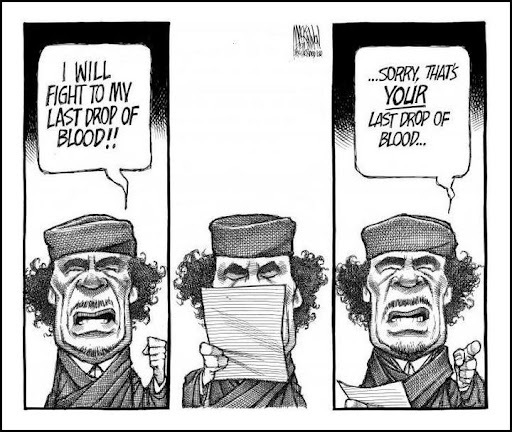 The US military made it possible for the insurgents to get Qaddafi. We don’t want to go down as having killed him. That is outside our laws. McCain actually, then, has done the Administration a disservice. AAAAAAAAAAAAJJJJJJJJJJJJJJJJJJJJ!!!!!!!!!!!!!! encore. I’ll alienate a lot of people by not celebrating Daffy Gadaffy’s death. You may recall that Gadaffy was inspired to make peace with the US when US troops pulled Saddam Huisien out of the latrine pit that he had been hiding in. Gadaffy ceased sponsorship of terrorism, surrendered control of his chemical weapons for destruction, and also surrendered Uranium and gas centrifuge equipment that US intelligence never suspected that Libya had. Gadaffy also cooperated with the investigation into A Q Kahn’s (father of the Pakastani bomb) nuclear black market which resulted in it getting closed down. Theincitement of a rebellion and provision of air support for that rebellion after having reach anaccomodation with Gadaffy destroys the credibility of the US. Never again will the US be able to negotiate a truce with dictators who support terrorism. This violation of trust occurring so soon after the US incited the rebellion against Mubarak of Egypt who had been a US ally for three decades will result in the US being viewed as a feckless and unreliable ally. Yes, Gadaffy was a bad boy but he had repented. We will soon learn that the rebels that we have supported, including members of Al Quida who fought us in Iraq in Afghanistan, will be far worse. Only one prominent potential contender for President demonstrated an understanding of these events. She has obviously been getting tutored in foreign policy by John Bolten. Unfortunately, the woman who has so eloquently demonstrated that her IQ is not inversely proportional to her bra size isn’t running. Excellent comment and points. I had forgot these points. It should be a blog post. Overnight I will try to get articles to support it and credit you with it JC. Rather than spending time as a powerless dictator / prisoner of international court , he met with this end unexpectedly .So many dictators died in this fashion .It is little painful to see this even though he was dictator .